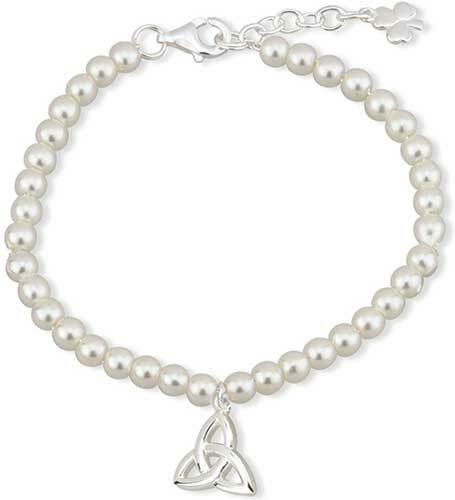 This Celtic baby bracelet, like all the Irish made jewelry at The Irish Gift House, is nickel free and hypoallergenic. 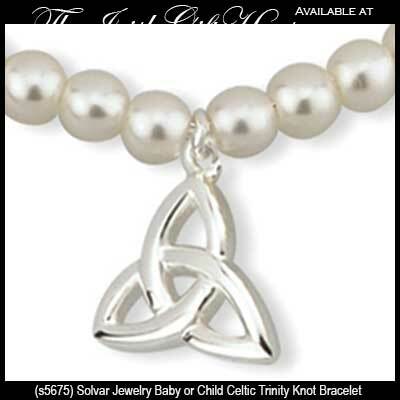 This Celtic baby bracelet is a silver plated design that features tiny glass faux pearls along with a Trinity charm that measures 3/8" wide x 1/2" tall, including the jump ring. The 5 1/2" long Trinity bracelet features a lobster claw catch and has an 1" extender chain with a tiny shamrock tassel at the end. 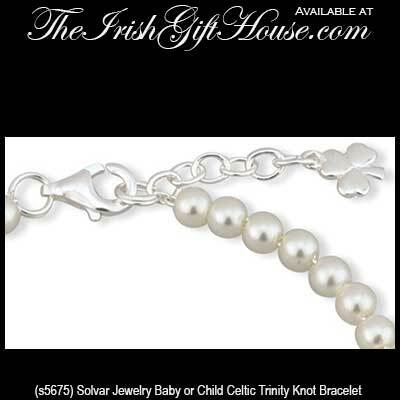 This child's size Irish bracelet is part of the Little Tara Ireland Collection from Solvar Jewelry in Dublin, Ireland and it is gift boxed with Celtic knot and shamrock history cards, complements of The Irish Gift House.